I knew it would hurt to get out of bed the moment I stretched out my legs. My left knee at the fibula where the IT band inserts. Both calf muscles and the Achilles’ tendons. The right lateral thigh along the entire length of the IT band. My deep, deep core muscles. They were all mad at me for what I put them through yesterday. After a self-imposed rest of 3 days due to inclement weather and a broken furnace, I set out for a long run. 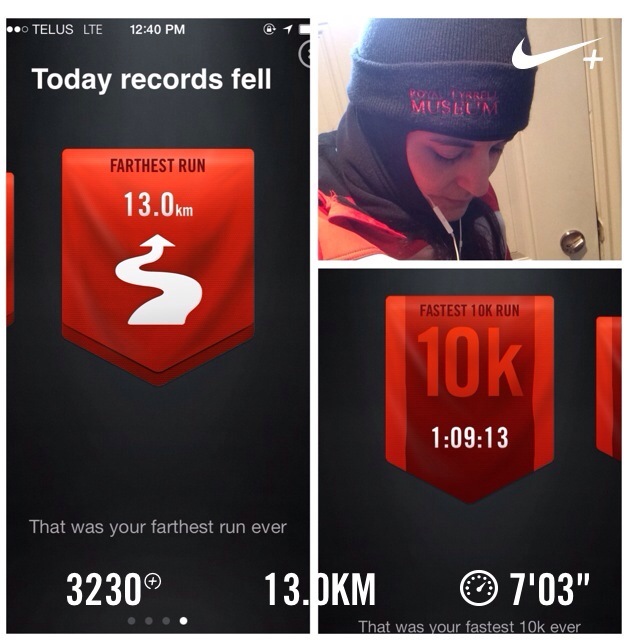 I’ve been increasing my distance by 1 km every 2 weeks, so this week had me facing 13 km. With all the snow that fell I knew that only the major streets’ sidewalks would be clear enough to run on so I headed out and ran to the office. I tried to take it easy as this was supposed to be a LSD but after each kilometer clicked by it became clear that I was running at my 5km pace. (I can hardly believe I can even say that!). I reached the office and kept going for another 1.5 km. By the time I had to turn back I was getting pretty tired. I briefly considered hopping on transit but remembered I didn’t bring my wallet or any loose change. I allowed myself a few extra 100 meter walk breaks and thank goodness for traffic lights. I was able to catch my breath and stretch out the legs. I made it home and felt like collapsing. My legs were jello and I was dripping in sweat. I drank a lot of water and made a cheese omelet even before I got all my gear off. I was starving. I stretched afterwards but obviously not enough considering how my legs felt this morning. A few hours later the dreaded migraine came on with a vengeance; a sign that I will need a water belt and gels for my next long run. I think I am going to wait another week before increasing my distance again. My legs definitely need a break. For the next few weeks I will stick to 5-10 km and work on getting my 5 km pace even faster. 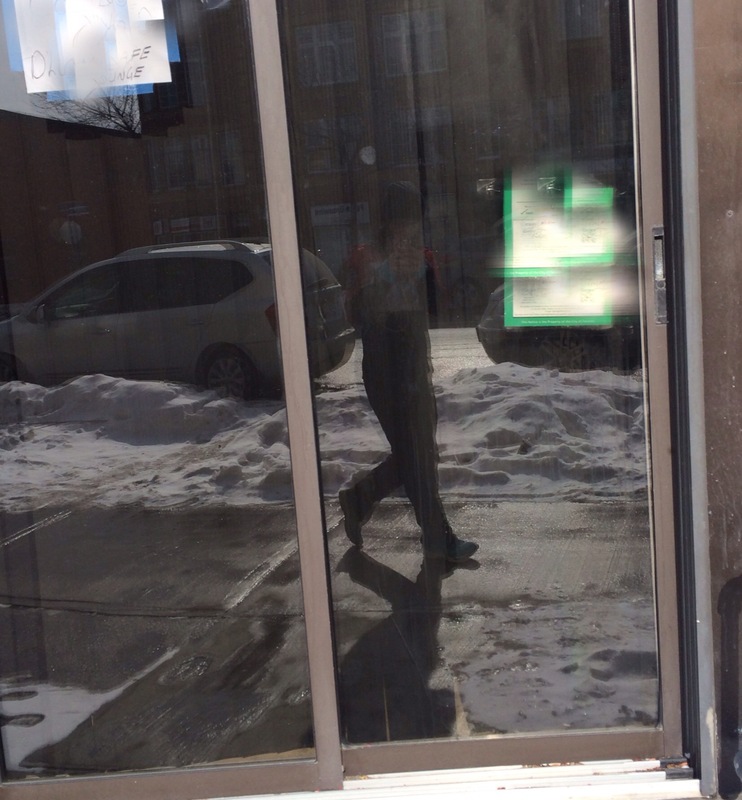 Oh and just for fun here’s a shot of me as I ran by a storefront window. I’m pretty sure this was around 9 km. I’m surprised I’m not completely hunched forward! I suppose it was bound to happen the way she swings around on those monkey bars. Last Friday after school I got a call from my husband that she fell off the monkey bars and probably broke her wrist. You know that sudden feeling in the pit of your stomach you get when you know something is wrong? That’s the feeling I got when I heard my husband’s voice. He is not one to panic or think the worst so for him to say he thought it was broken I knew it was serious and I knew he was probably right. I’ve never broken a bone so I have no idea how painful it is but I know it hurts. I’ve seen both adults and children with broken bones. When I got home and saw my daughter’s tear-stricken face and the tell-tale swelling of her little wrist my fears were realized. She was cradling her arm so carefully and refused to allow us to touch it or put it in a sling. My heart broke for her. I never wanted her to experience that kind of pain. What parent does? The six-hour wait in the ER was long. She wasn’t allowed to eat in case she needed conscious sedation to set the fracture. It took two hours after the x-ray to see the doctor who ushered us into the orthopedic room where the casting supplies were. The ER doctor was a lovely young female resident in her second year of training and she was very calm and comforting to my daughter. I asked her how many casts she’d done that day and she smiled when she answered. She’d done five including my daughter and all were children who’d suffered injuries on the playground. My little girl was so brave and admittedly scared when the cast was being applied. She didn’t want anyone touching her arm because it hurt. 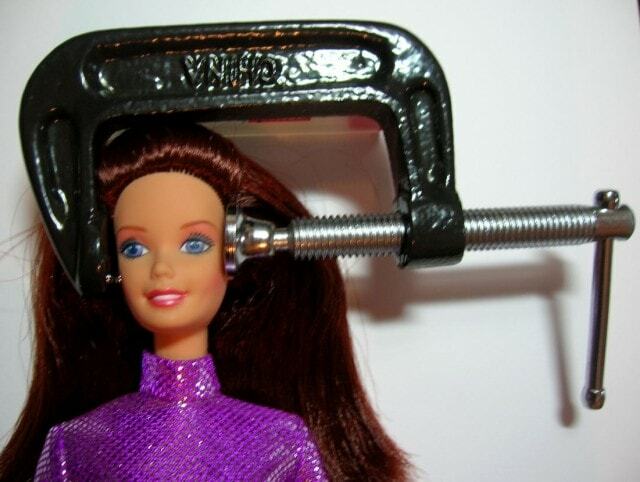 Thankfully the doctor ordered some Advil and Tylenol to take the edge off a bit and it seemed to work. She suffered what appeared to be a greenstick fracture of her distal radius. 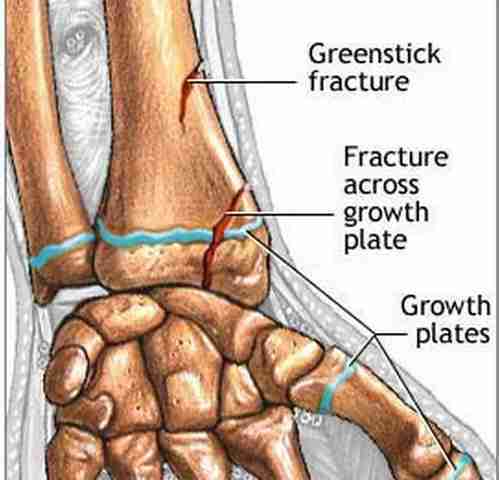 From www.kidshealth.org – a greenstick fracture is a partial fracture in which one side of the bone is broken and the other side bends (this fracture resembles what would happen if you tried to break a green stick). 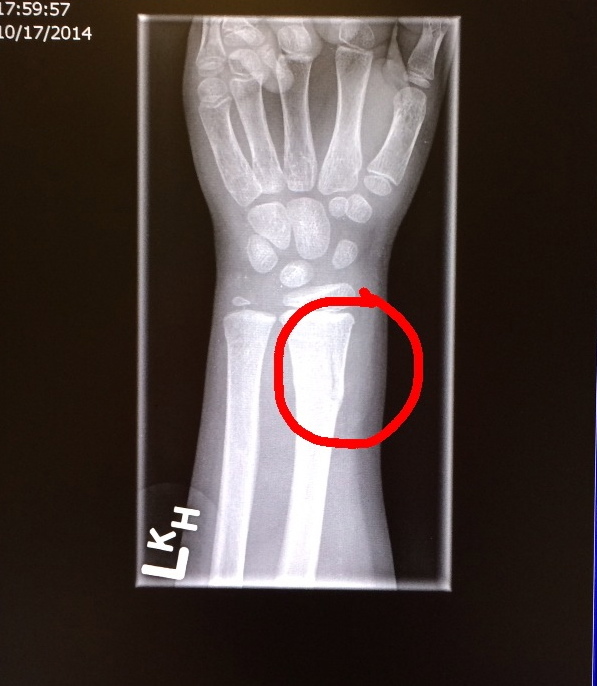 It is a common fracture in kids and is considered an incomplete fracture as their bones are softer than adult bones. Children’s bones are more likely to bend than break completely. She was put into a thumb radial gutter cast because she had a bit of tenderness in one of the wrist bones as well so the ER doctor wanted to make sure to immobilize the thumb in case there was a second fracture that wasn’t visible on the x-ray. 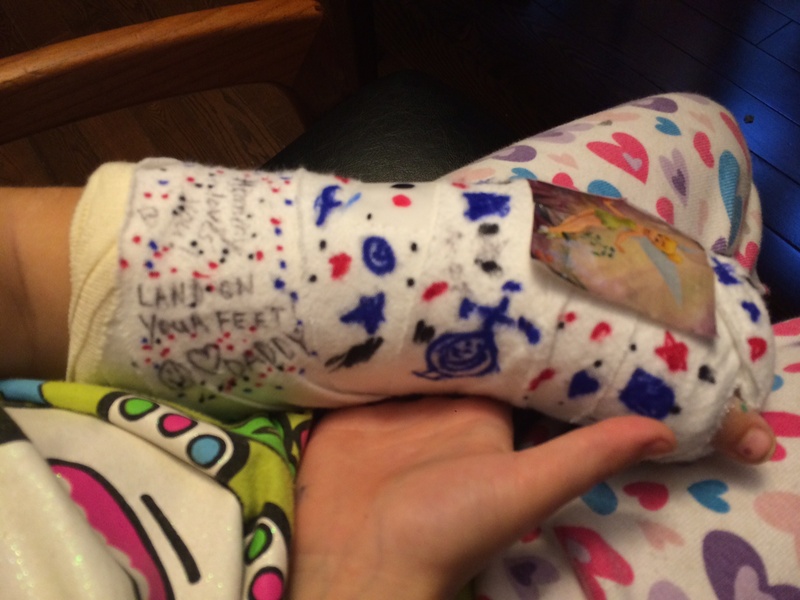 It is a temporary cast and is open on the ulnar aspect of her arm in order to allow for swelling. In a week or two we will go to the fracture clinic where she’ll have another x-ray and likely be put into a fiberglass cast for a few more weeks. I’m thankful that she landed on her left arm as she is right-hand dominant and loves to draw. 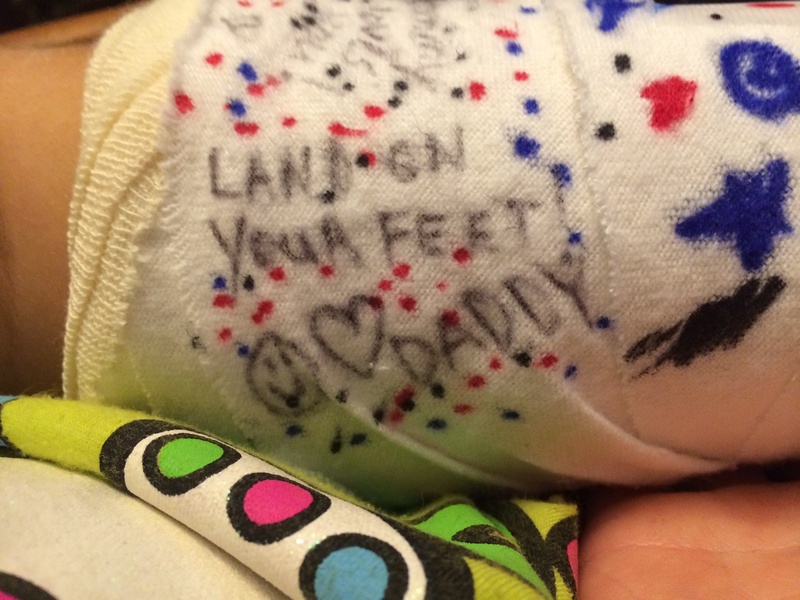 Within 12 hours of the cast being put on she had already started decorating it. 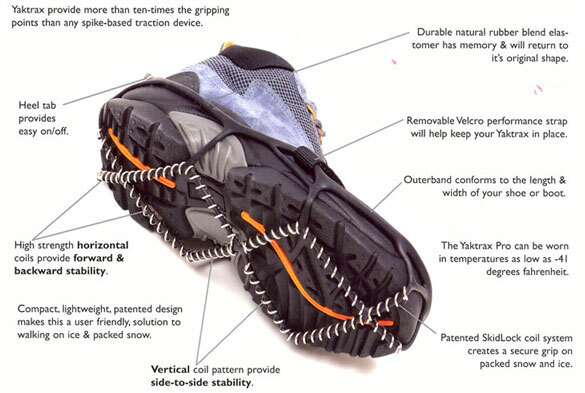 Snow Tires – For Your Feet! I’m wondering if I should start a running blog? In the meantime, let me tell you about the new little piece of gear I picked up today. Remember that crazy run in the snow I wrote about the other day? 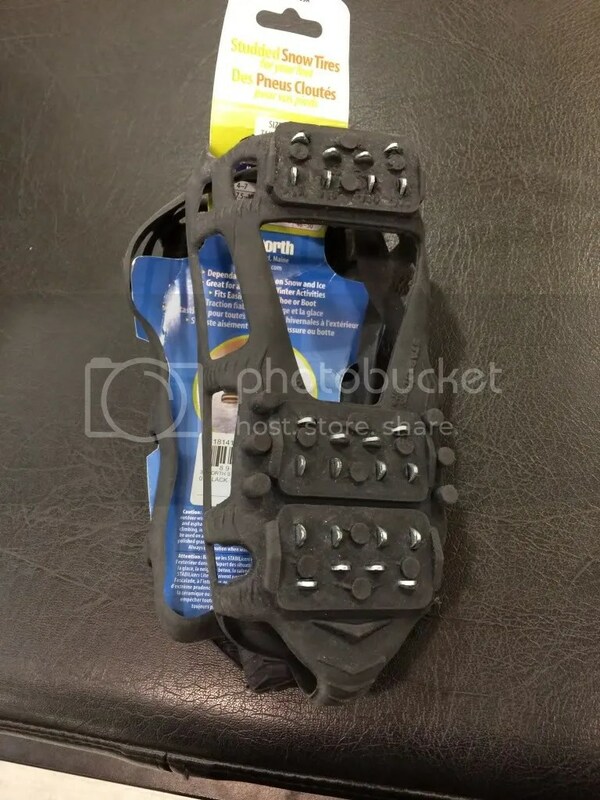 Well, today I decided to get some Yak Trax. Say whaaat? The first time I heard this term, I thought … well, I won’t tell you what I thought. I called a bunch of stores in my area and most were sold out. Husband wanted to look at some skis so off we went to the local SportChek and bingo! One last pair was available. Now, the weren’t the name brand type as pictured above, but a cheaper version which looked pretty good. (My neighbor who runs marathons regularly showed me the pair he had and the ones I picked up looked pretty similar. I really wasn’t sure what to expect, so I went for a test run up and down my sidewalk to get a feel for them. I liked the way they gripped the snow on the snowy bits of sidewalk and found they weren’t too slippery on the parts of sidewalk that was cleared. So, off I went. The plan today was 5.5km. I had hoped to make it a steady, straight run, but by 1.5km it became quite apparent that my calves were very, very upset with me. The short 2km run I did in the snow yesterday came back to haunt me, or I should say, my calves. Anyway, it was a tough run and because of the discomfort, I decided to take some walk breaks and ran 300 m short of my goal; I ended up running the 5.2 km in 10s and 1s. I’m glad it’s in the books but I am sore now, all over. My back, calves, ankles, core — it all hurts. I cringe at the thought of what I’ll feel like tomorrow. I thought I should share my 10km training schedule. Runners, please tell me your thoughts. I am giving myself 8 weeks. I know it’ll get better. I also know tomorrow will be worse. It always hurts more on the second day. It’s all worth it though, right? Right? I am probably deluding myself, but I feel a millimeter more toned today than I did yesterday. Seriously. The next step on this path to a righteous body (lol!) is to cut out the chocolate. I’ll let you know how I do on that front in another post. Now then, where is that bottle of Advil? A Birth Story – Part Two. Right – husband brought the kids to the hospital, they met their new little brother, my parents arrived and the entire family met the new little man. Then, my nurse came in to check on me and ushered everyone out of recovery. This is when it got interesting. In every patient post-delivery, it is common practice for the nursing staff to check the woman’s bleeding and status of the uterus – firm or boggy. The nurse checking me said I was “oozing”. The next thing I know, my OB is at my bedside ordering IM (intramuscular) Ergot, PR (per-rectal) misoprostol and IV (intravenous) oxytocin. Then my OB starts massaging my uterus, and not in that “ah, what a nice massage” kind of way, she is pushing down on my uterus with such force that I cried out in pain. Remember, this is only 1 hour post-operatively and I was still pretty much frozen from the upper abdomen down to my legs from the spinal anesthetic. Frozen yes, but oh my, I could feel that “massage”. It was awful. No one said anything, but it was obvious to me that I had just had a postpartum hemorrhage. Caught very early, mind you, but a hemorrhage nonetheless. Thankfully, no one in the family knew what was going on as my husband had taken the baby to the waiting room while the nurses worked on me. Eventually it was time to head up to the postpartum/maternity ward. I had requested a private room and got one, thankfully. Once I was settled, it was almost 6pm, maybe a bit later, and the kids were getting super antsy, so husband took them home. My brother stayed behind to visit for while and bonded with his new nephew. About an hour later, my best friend came and spent a few hours with me and new baby which was so nice. Although I was pretty tired, I was still bedridden and admittedly a bit lonely after everyone left, so it was so nice to have her there. That first night was pretty good. Baby latched, nursed on an off most of the night, and the post-op pain was relatively well controlled until about 4am when I started noticing I was passing gas and the pain started. I asked for pain relief and was given SC (subcutaneous) morphine which helped. A few hours later, the nurse had me getting up to the bathroom, she removed the catheter and I was encouraged to start walking around as much as I could. The OB resident came in to see me and dropped the not-so-subtle hint that I might be released the next day. Only 48 hours post-op? Seemed a bit soon to me, but apparently the “rules” had changed since having my son 2.5 years ago. It used to be women were discharged 72 hours after c-section. Now it’s 48 hours. Too soon, in my books. Too soon. Later that day, another girlfriend came to visit. She is due in a few weeks with her first child. It was lovely to have her come visit. She brought me an ice-cold lemonade and some aromatherapy for my sore neck. But by the end of that visit, I was noticing some new pain starting. Under my rib cage, on the right side. Kind of like a muscle spasm. After she left, I asked for some pain medication. For some reason, I wasn’t allowed to have any SC morphine, so instead I was given 2 mg of hydromorphone. It did nothing. Around 10pm, the pain was escalating and I was starting to get really emotional about it. It hurt to take a deep breath, and of course, crying didn’t make it any better. It was probably the worse “stitch” I ever had – you know, those pains in the chest wall you can get when you run too fast? Well, now that I think about it, it’s exactly what it felt like but 100 times worse. I called my husband and cried on the phone to him. I hadn’t slept all day, baby was cluster feeding that night since about 7pm and I was exhausted. When I was on the phone with him, my nurse came in and saw me crying. I hung up the phone and just let it all out with the nurse. She said she would page the OB resident on call and see about getting me more pain meds. About 20-30 minutes later, the nurse returned and told me that the OB was too busy to come see me, but had ordered 10 mg of oxycodone. The last thing I remember was texting my husband an hour later, telling him that I could feel the meds working and the pain was better. Then, nothing. I woke up at 4am with the baby on my chest, asleep. I have to admit something here, I felt good! Not just pain-free good, but “I’m kind of high – good”. Wow. Suddenly I understood how easy it can be for some patients to get addicted to Oxycodone. It’s a very dangerous narcotic, one not to be taken lightly – pardon the pun. That morning, the OB resident came in and told me I could be released that day. I explained my pain from the previous night and that I was not comfortable leaving. My concerns were heard and I stayed an extra day/night. The rest of the recovery went pretty smoothly. That horrendous muscle spasm pain never returned, and I later discovered from my med school colleague (and good friend) that the manipulation of my fallopian tubes likely caused the pain – referred pain to the diaphragm. It was great just to have an explanation for it. It was awful pain and at that moment the physician in me took a backseat and I was just a patient. In retrospect, I’m not sure knowing the origin of the pain would have helped at all at the time. I am just glad that it was short-lived. I was released on the third post-operative day (72 hours after delivery). The kids hadn’t seen me or the baby in two days so our reunion was wonderful. In the last 2.5 weeks, life has slowly returned to our new normal. Husband gets the kids ready for school in the morning. The baby and I are camped out in the basement as he sleeps on my chest at nighttime still. It’s the only way both of us get any sleep. Eventually, I will move him to the bassinet, but likely not for a few more weeks. The decision to have a third child was a difficult one. We went back and forth for almost 6 months. Despite the sleep deprivation and the generally chaotic nature of our life right now, I cannot imagine not having had my new son. I can’t put it into words, but I truly feel complete now that I have had him. My family of four was perfect – but my family of five is so much more. I can’t wait to see who this new little person is and how he’ll fit into our lives. I’m back on vacation this week. I know, tough life, right? Trust me, I’m not complaining. I get to watch Olympics all day long, if I like, and I like. But today’s post is not about vacation, or the Olympics. It’s about pain. The pain of exercise. The good kind of pain. I am in quite a bit of pain the last few days. The other night, I decided I needed to start working on my abdominal muscles. I used to have a little six-pack, many eons ago, before the children. I always had a small waist and I miss it. I would love to have it back. Sure, there is some extra skin now from the two pregnancies, but surely with some work, that skin can get taught again, no? So, I dusted off some exercise videos the other day and found the one I was looking for. Bodies In Motion used to be on television many moons ago and I used to work out to Gilad almost every morning. I was thrilled when I found his DVDs online. I felt great doing his workout a few days ago, I pushed myself and even did a few of the “advanced” exercises. The next morning, I felt good. The day after? Oh my god – every single abdominal muscle was screaming in pain. Every.single.one. I even felt muscles I forgot I had, namely those serratus anterior guys and the lattisimus dorsi. It’s good pain though, right? Right. Later that same night, it was time for a run. I was aiming for 5k but the route I took had some hills (one downhill and two uphill). The downhill was great! I took my time, small strides and all, but could feel the shin splints getting tight. Still, I ploughed through and walked a bit extra in between runs. The hills were a challenge. The first hill was really an inclined driveway slope (yes, I made that up) at the entrance of the trail. I took my time and remembered my friend’s advice to keep my steps small. I ran this way into the next hill, a long but gradual uphill road. It was hard. Really hard. Remember, I only just started running about a month ago. In fact, I took this same hill with my girlfriend on my 3rd ever run and I had to walk it. This time? I made it 2/3 the way up then had to walk the rest. I wanted to push myself but knew it would be too much. This morning, I felt like I had been hit by a truck when I woke up. Every muscle in my legs was on fire. That damn Achilles tendon was aching this morning too. I certainly pushed the limit last night and yes, I’m in pain, but it’s the kind of pain where you know the efforts are working. My body remembers what exercise feels like and it wants more. So, I’m in some pain today but its all for a good cause. I promise to get back to the mothering and medicine portion of this blog real soon!